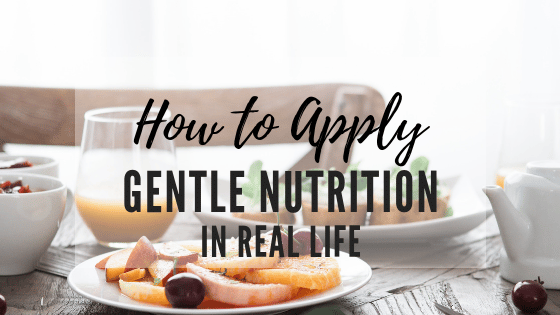 Today I’m sharing a few ways that you can apply the principle of gentle nutrition to intuitive eating, to help make nutritious meals easy and convenient. I’ve partnered up with the Florida Department of Citrus to bring you this post, meaning I was compensated for my time, but, as always, all thoughts and opinions are my own. Breakfast used to be my favorite meal of the day. I’d wake up hungry and excited, anticipating what was in store for my first meal. Over the past few years this has changed – now I find myself more stressed than excited about the prospect of making breakfast. This is partially due to my shift in mindset from scarcity to abundance. Since I’m no longer following food rules or restricting food during the day, and I allow myself to eat whatever and whenever I want, I no longer have the urgency to eat breakfast right when I wake up. Once I started listening to my body, I discovered that I’m not very hungry most mornings. But lately, breakfast has gotten even tougher for me to manage. Work has been busy, which means I’m usually in a rush to get out the door. I’ve also been seriously slacking when it comes to grocery shopping, so I often don’t have much food in the house. Combine the morning craziness with my minimal appetite, and it’s been a struggle to get a nutritious breakfast into my body. Turns out I’m not alone. A recent survey of millennial parents showed that 55% of people find it difficult to feed their family a nutritious meal each day, due to a struggle finding nutritious options that are both easy and convenient. Of those, 37% of respondents said that breakfast is the most challenging meal of the day to make nutritious. I can relate to this so much! Even if I’m not hungry when I wake up, most days that is my only chance to eat until lunch. So if I don’t eat breakfast, by mid-day I’m cranky, starving, and battling some serious low energy. Another thing I’ve noticed about my breakfasts lately: I tend to only eat one food group. While this is ok from time to time, I realized that I haven’t been eating very much fruit. So I turned to the intuitive eating principle of gentle nutrition to figure out some easy and convenient ways that I can add back in more fruit to my morning meal. Gentle nutrition is about making positive food choices from a place of honoring your health, rather than a place of restriction. Once you’ve made peace with food, tuned out the food police, and are able to make food choices without fear or guilt, then you can work on adding in gentle nutrition. When it comes to fruit, I know that adding it to my diet will give me many different types of vitamins, minerals, antioxidants, and fiber. I also know that it will help make my breakfast meals be more filling and more satisfying. Both whole fruit as well as 100% fruit juice count toward your daily recommended servings of fruit. For example, an 8-ounce glass of 100% orange juice provides one serving of fruit, an entire day’s worth of vitamin C, along with potassium, folate, great taste, and no added sugar. Plus, research shows that people who drink 100% orange juice may eat more whole fruit and have higher diet quality compared to people who don’t drink it. So not only is 100% juice a great complement to whole fruit to help meet your fruit intake, but you also may end up eating more fruit overall. 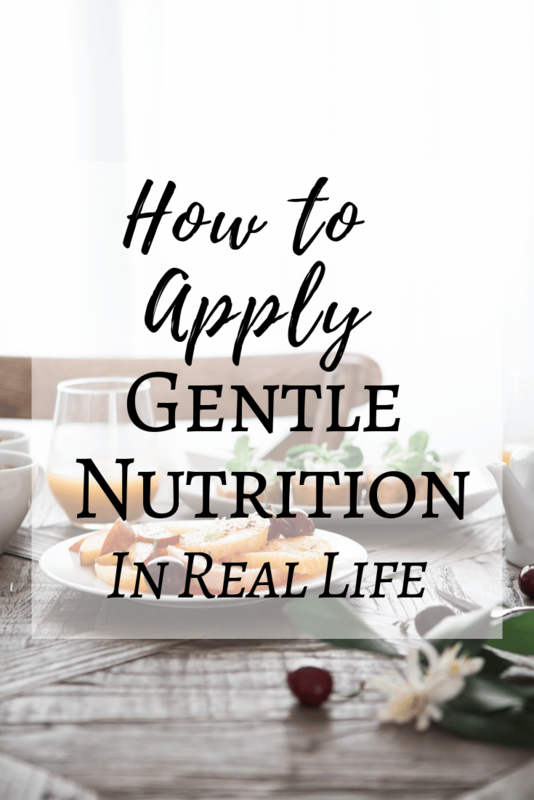 Gentle nutrition for the win! Spend 10-minutes meal planning. Every weekend, I look ahead to the coming week and make note of what meals are covered already (such as lunch meetings or dinners out with friends), then write down how many breakfasts, lunches and dinners I’ll be responsible for making. I then make a list of the different recipes or go-to meals I’ll plan on preparing throughout the week. With the goal of adding in more fruit, I’ve been picking recipes that include whole fruit or 100% fruit juice so that I get the added vitamins, minerals and fiber. Carve out time to grocery shop. Once I’ve got my list of recipes, I compare the ingredients to what I currently have in my kitchen and then write a grocery list to fill in the gaps. I love going to the grocery store, but if it’s not your favorite thing to do – or if you can’t find the time – consider ordering groceries online for home delivery. Figure out what can be made ahead of time. During a busy work week, the amount of time I have to cook is pretty minimal, which is why I love make-ahead meals. Look for recipes that can be made beforehand, whether that’s the night before or several days before. Double or triple the recipe and save the leftovers for other meals, or freeze to have later on. Orange Homemade Granola – this homemade granola combines oats, nuts, seeds, dried fruit, and the taste of 100% orange juice. It pairs well with milk, yogurt, or on top of a smoothie bowl. Make a single or double batch, then store for up to a week. Berry Breakfast Strata – prep the ingredients for this egg strata the night before, then all you have to do in the morning is pop it in the oven for a warm, delicious breakfast that everyone in the family will enjoy. Avocado & Banana Citrus Smoothie – drinkable breakfasts like this smoothie are perfect for when you need an on-the-go breakfast. The smoothie doubles as a meal because it’s packed with protein, fat, and carbohydrates to fill you up and the sweet taste of 100% orange juice to satisfy your taste buds. Orange-Vanilla Overnight Oats – this easy oats recipe comes together in less than five minutes. You can make this recipe ahead of time for a quick nutritious breakfast in the morning that will fuel you and your family throughout the week. Pumpkin Baked Oatmeal with Streusel – with just two steps, this baked oatmeal recipe couldn’t be easier. You can eat it warm right out of the oven, or stick it in the fridge and eat it cold in the morning. I like to top mine with a dollop of Greek yogurt and peanut butter. Blood Orange & Pistachio Muesli – this muesli recipe is soaked in the refrigerator and eaten cold, giving it a similar texture to overnight oats. Topped with pistachios and blood oranges it makes for a bright, naturally sweet breakfast. What are some ways that you add more fruit variety to your meals? Share with me in the comments below! Interested in learning more about intuitive eating? We work with clients virtually throughout the US, helping people who are frustrated with dieting change their relationship with food and say goodbye to diets once and for all. You can learn more about our intuitive eating nutrition coaching programs to see how you can find balance and develop long-term lifestyle habits, no diets required.